Choosing your bridesmaids is one of the most important decisions for your wedding day. It’s often instinctive and one born out of great love, loyalty and, let’s be honest, a whole heap of fun. They are the girls who have been there for you. The ones who know you best and you will most definitely need them with you every step of the wedding-planning way. Whether they are your sisters or your oldest friends, they are most definitely your best girls. When it comes to the big day it seems only fitting to give them a little “thank you” – to show them how much you appreciate their help in the run up to the wedding, how much that little squeeze before you walked down the aisle meant and how that prosecco fuelled crazy dance at the end of the night is one moment you will never forget. I certainly know I felt this way about my bridesmaids, especially the last point! I had my sisters as my bridesmaids and I loved having them there with me so wanted to choose a special gift to give them on the morning of the wedding. Yes, it is tradition to give your bridesmaids a present, but for me I also wanted them to have a little memory of the day to keep. For this reason I chose to give them each a pair of beautiful earrings and nine years later they both still wear them. Seeing this makes me know I made the right purchase. To me, a gift of jewellery is the perfect choice as I’m a bit of a sentimentalist and I love nothing more than wearing my favourite pieces to evoke memories. You know your bridesmaids best so think about their tastes and their personalities and choose gifts to compliment. Also, make sure you know what jewellery they actually wear. I’m guessing you already know their style but is there a special piece they already have that can’t be replaced? For example, my younger sister has a necklace given to her by a late friend and I therefore knew that no other necklace would ever be worn. You don’t need to go with the obvious jewellery choices. How about some gorgeous stacking rings to adorn their fingers? We adore this trend and are pretty sure your bridesmaids would too. To make your gift even more special, include something that evokes memories or is meaningful to your relationship. At my sister’s wedding she gifted me a beautiful print with a quote from one of our favourite childhood books, an idea I love. If you can’t get hold of a print, you could of course include an actual copy of the book to accompany the piece of jewellery. Whilst on the quote theme, a beautiful friendship print is sure to get your girls having ALL the feels. You can even match the gifts to your friends’ personalities choosing the jewellery, fonts and colours that reflects their own individual traits. If you friend is a classic girl then go for an elegant Essence charm bracelet coupled with a timeless black script quote. For the fun and flirty friend then go bold with bright colours and graphic prints together with a vibrant birthstone ring. As you know, we love the little details so it’s definitely worth thinking how you are going to present your girls with their gift. 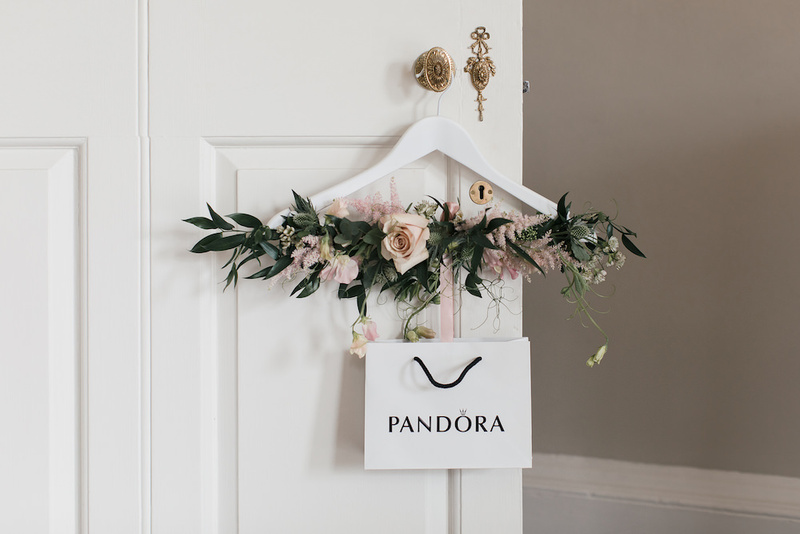 Handing them over with a hug is obviously the best way but how about hanging a cute little gift from their dress hanger? If you are choosing to give them their gifts during the wedding breakfast then place the gift on their place setting for them to find when they sit down. It’s sure to get a few smiles and perhaps some happy tears too. Have you started to think about gifts for your girls? What will you be choosing and have you ever received a beautiful bridesmaid gift yourself? I absolutely love this idea I can’t wait to do something similar for my bridemaids. Where did you get the hanger please?